i was soooooo excited to see paige mention on facebook a few weeks back that she was ready to host her very first diy masterclass, because i've been a massive fan of paige's crafty and creative style since i first discovered her blog a bazillion years ago. 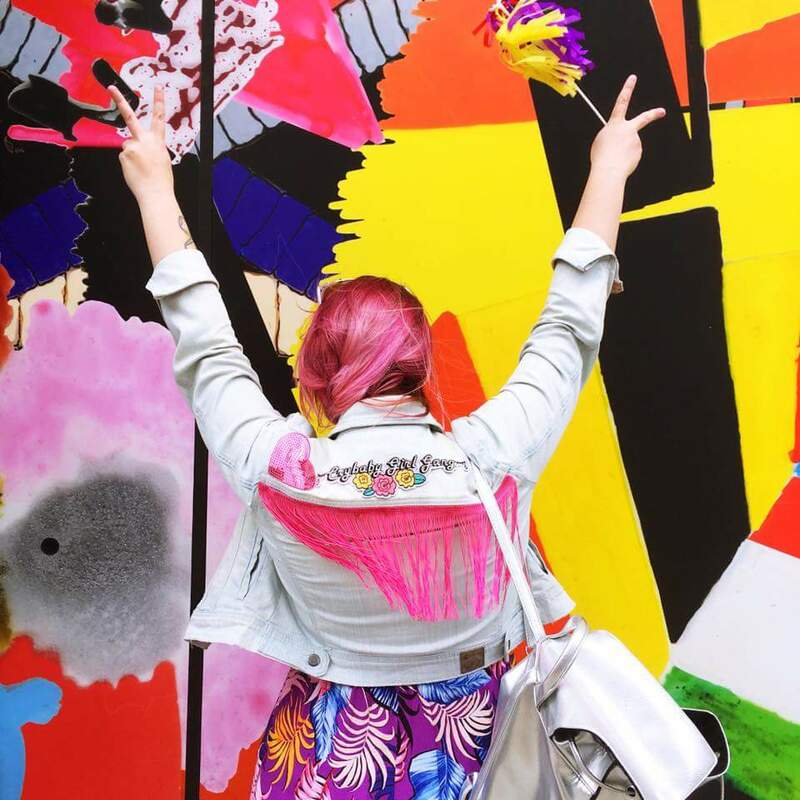 her collection of brightly coloured and personalised jackets is the thing my dreams are made of, so to have the chance to have her direct me how to make one of my own - i was buzzing. 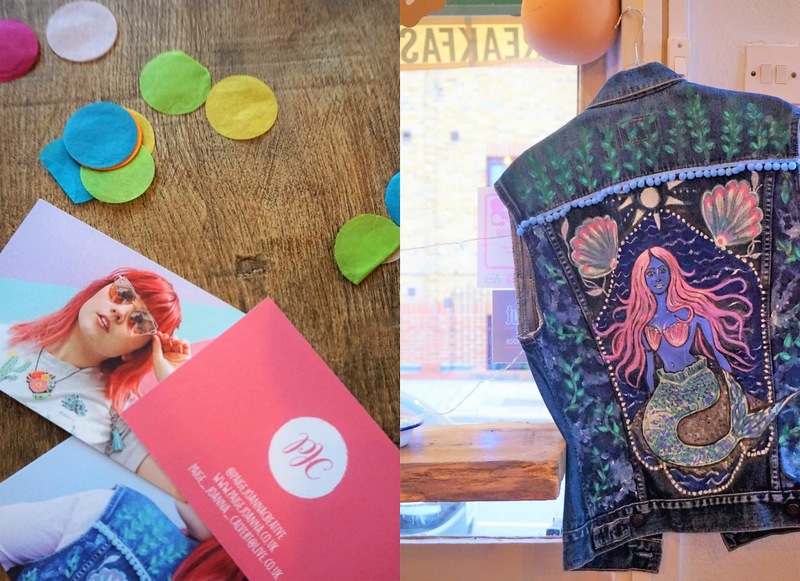 especially because i've really grown my denim jacket collection over the last few months, with a new light blue and a black denim one added to the pack most recently, all i need was fore a few jazzy bits to be attached to complete the colourful look. 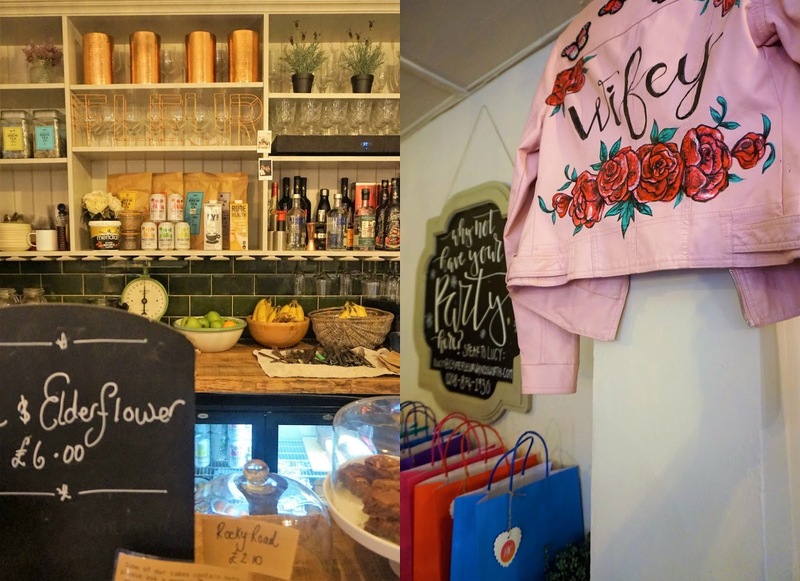 the event was held at cafe fleur in wandsworth, which is a place i had neeeever been before. wandsworth is a bit out of the way for me, but it's a really pretty part of town, so not a problem at all. the cafe is totally cute too, so i can see why paige has decided to hold her workshops there! we were greeted with glittery cupcakes and fizzy drinks, as well as as much tea and coffee as we could consume, and then we got to work. paige had supplied sequins patches, tassels, pom poms and more, and we had our pick of all the jazzy materials. it was a magpie's delight! an hour and a bit later, and i had one pink, bedazzled masterpiece on my hands! 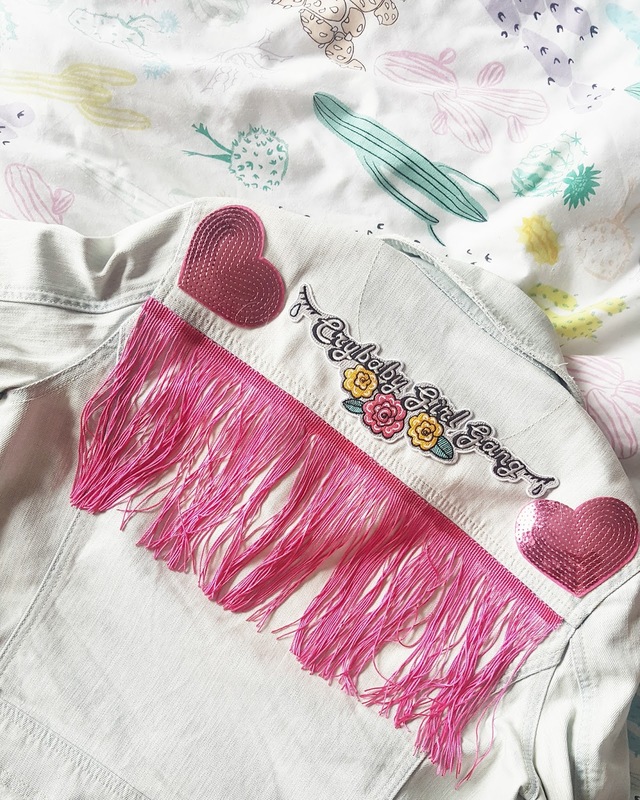 i was able to attach my cry baby girl gang patch as well as some hot pink sequin heart patches, and some increddddible pink tassels to the shoulderline, making the jacket look something out of a disney western film, but, it's mine, and i love it. i absolutely love it. i've added a few stitches to all of the patches just to keep them attached, and now, i can't leave the house without it. if you fancy having a go at diy-ing your own wardrobe essentials, then keep an eye on paige's, err, page, where all the info will be released when there is info to release. thanks for the help, paige!